"Grandma Oma always made these, and I still do. They are a welcome change on a relish tray." 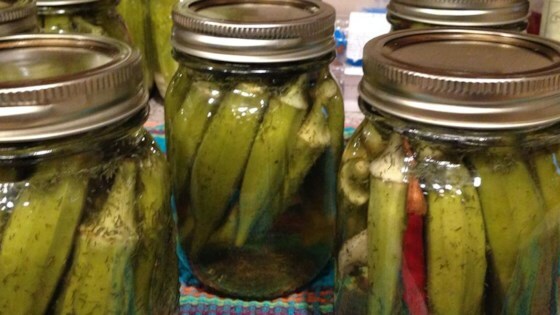 Divide the fresh okra evenly between 3 sterile (1 pint) jars. Place one dried chile, and one teaspoon of dill into each jar. In a small saucepan, combine the water, vinegar and salt. Bring to a rolling boil. Pour over the ingredients in the jars, and seal in a hot water bath for 10 minutes. Refrigerate jars after opening. These were easy and fast and a great way to save summer okra. The only thing I did differently was add one whole clove of garlic but they came out fabulous! My boyfriend, a Louisiana boy, loved these, but said he would have preferred them without the red pepper. This is great and oh, so easy! I liked the added garlic clove to the jar. I didn't have dried red pepper on hand, so I added 1 tsp red pepper flakes to each jar.